NonDeScript | Living without a script. Here’s a How-To article I wrote on how I manage the daily onslaught of disgruntled clients. Click the above link to read the article. If you would like to read more How-To articles I have written, Click here to view my EHow.com profile. 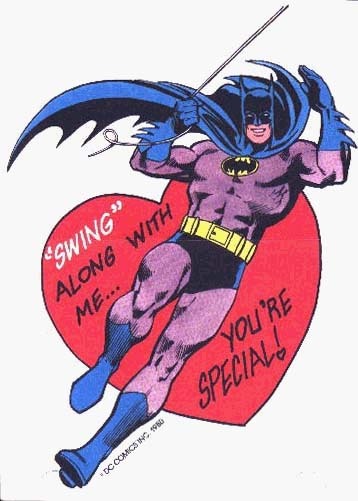 Did Batman foil the Joker’s plot to steal all the chocolate hearts on the 14th? No, he gave him THIS. 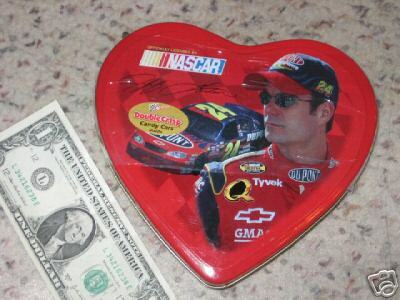 Did Jeff Gordon cry when female NASCAR driver Shawna Robinson rejected his advances on the racetrack? Of course not! Instead, he sent her one of THESE! You see, this holiday is not just for the betrothed and the beloved. It is for all the “haters,” too. If you are feeling bitter this weekend, then I have the perfect gift for you to send to that special someone (or nemesis): A FREE GREETING CARD! Download this royalty free greeting card, print as many as you like, and send it to everyone you despise. Happy Valentine’s Day. I love you. You learn a lot about someone when you share a car, and in turn, learn a lot about yourself. Because I no longer drive my gas-guzzling tour van around town, my fianceé and I necessarily share a vehicle. When I made the decision to leave my van in the carport to collect dust, we each had to learn a few lessons in sharing. For starters, we had to start coordinating our individual schedules; I had to reserve car time in advance to ensure that I was not compromising her schedule, and we have developed a habit of having an informal family meeting on Sunday evenings to discuss the forthcoming events of the next seven days. While we have learned a lesson in the value of other peoples’ time, we have failed to learn the virtue of cleanliness (which is now above Godliness). We are both marginally tidy regarding personal affects, but lack the discipline required to collect the elusive paper waste that accumulates on the floorboard. The result: a monthly purge. When one of us finally reaches our tipping point (usually me), we scoop out all the trash to be sorted, recycled, and discarded. What I find most, however, is junk food wrappers (admittedly mine). During my teens, my church youth group adopted two portions of highway in our hometown. This meant that once a quarter, the lot of us donned orange safety vests, rubber gloves, and work clothes and crawled down into the ditch to start cleaning. Our chain gang filled bag after bag full of soggy refuse from all walks of life. Save for the occasional flattened armadillo, the overwhelming yield was fast food waste. Environmental stewardship is the new littering, and it is time for a change in the way we consume. Most often, if we consider eating fast food, we think about how it will affect our bodily health. We might also weigh the meal’s impact on our monthly budget. But do we the amount of waste that stands between the morsels’ creation and their digestion? Regardless of the answer, we should start thinking about it. For a colorful and entertaining online brochure about the American fast food industry’s paper consumption, CLICK HERE. My fiancee’ claims she was making tea and needed to squeeze this bear for honey. It looks more like she’s trying to squeeze him for information. A friend of mine tends a blog called Carbon Trace, which chronicles his withdrawal from a dependence on oil. His name is Andrew Cline, and he anticipates that though gas prices have dropped temporarily, they will continue to increase in the years to come as cleaner, more efficient energy is made available to ordinary citizens. While perusing his blog, I found a widget for “The Go By Bike Challenge.” It is a campaign that challenges participants to reduce their weekly carbon footprint by changing their transportation habits. Instead of hopping in the car next time you crave some junk food from a nearby convenience store, why not hop on your old two-wheeler and pedal there instead? One of the benefits of converting from automobile to bicycle is burning calories. The challenge’s easy to use mileage calculator shows you the number of calories you will burn weekly by making the switch. The benefits do not stop at the belly, mind you. For the metabolically gifted, perhaps an incentive to save gas money will entice you? The calculator adds that amount up, too. Finally, if you just have too much money lying around, pledge to pedal and reduce your carbon footprint. “But Nathaniel, I don’t have a bicycle.” No problem. Go on foot everywhere you can, save up some of that extra gas money, and visit one of your participating bike shops to get started. I walk to work or ride my bike every day (1 to 2 miles per day) and decided to increase my green mileage. I signed up through A&B Cycle of Springfield, Missouri through the Go By Bike Challenge calculator. Check out the calculator on the left sidebar and see how many A&B Cycle customers have pledged to conserve their money, health, and emissions. In the age of narcissistic voyeurism (we love to “google” ourselves) arises a new outlet for concise, creative expression:12Seconds.tv. Similar to Twitter, a text-based site that allows “Twitterers” to post status updates up to 150 characters in length, the 12Seconds user has a small space (a twelve second video) to convey a thought. The site has a built in video recorder that will engage your webcam, and users may also upload a video file from their computer or capture and send it with their mobile phone to a unique email address. I use the latter format out of convenience. For a 12 second video about 12Seconds.tv, click here. It takes “Swagbot” twelve seconds to say something awesome about unicorns. It takes “sigveA” twelve seconds to play percussion on a reservoir pipe. It takes this guy twelve seconds to walk to the bathroom at his office. This site, like most new social media tools, caters to the tiny attention spans of most internet users. For some insight on the mind and matter of this generation, known as the Net Generation, check out Don Tapscott’s new book, Grown Up Digital. Though 12seconds.tv might still be under Tapscott’s radar, he offers great commentary on the Net Gener’s inner desire to create, broadcast, and memorialize every detail of their existence for future generations to discover. Time capsules are no longer limited to physical artifacts, and these online time capsules will not go away. Do you have 12 seconds on your hands? Sign up for a free account and this moment will last forever!